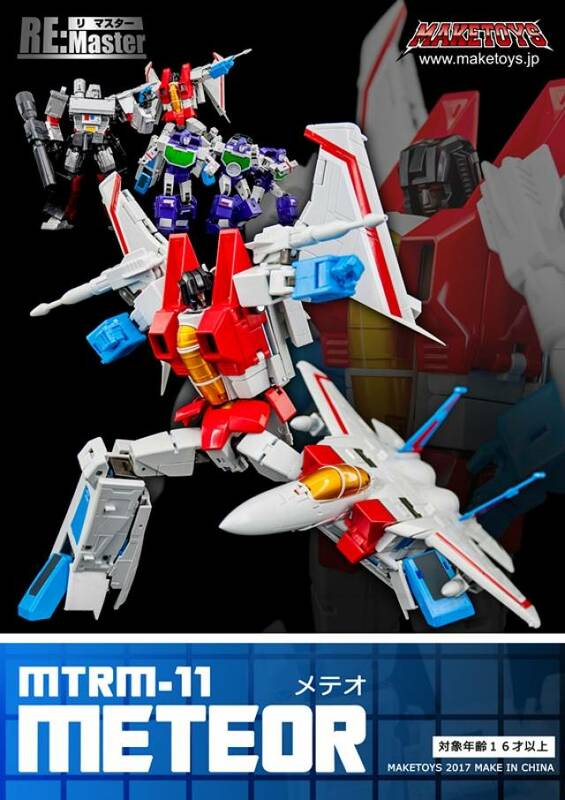 Make Toys MTRM11 Meteor is the latest figure in their Remastered Series. Figure is approximately Masterpiece Scaled and transforms from fighter jet to robot and back. 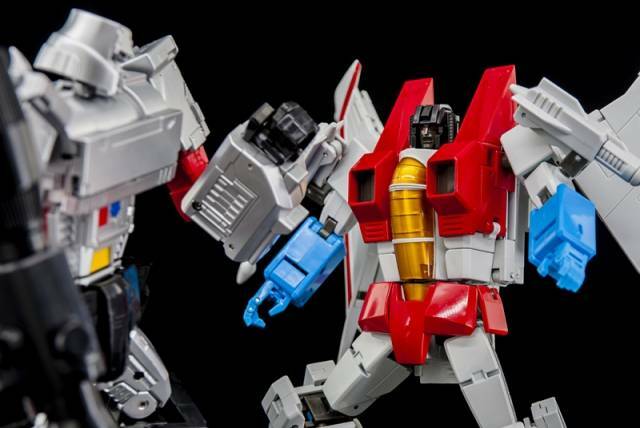 "Best starscream made by far !!!" 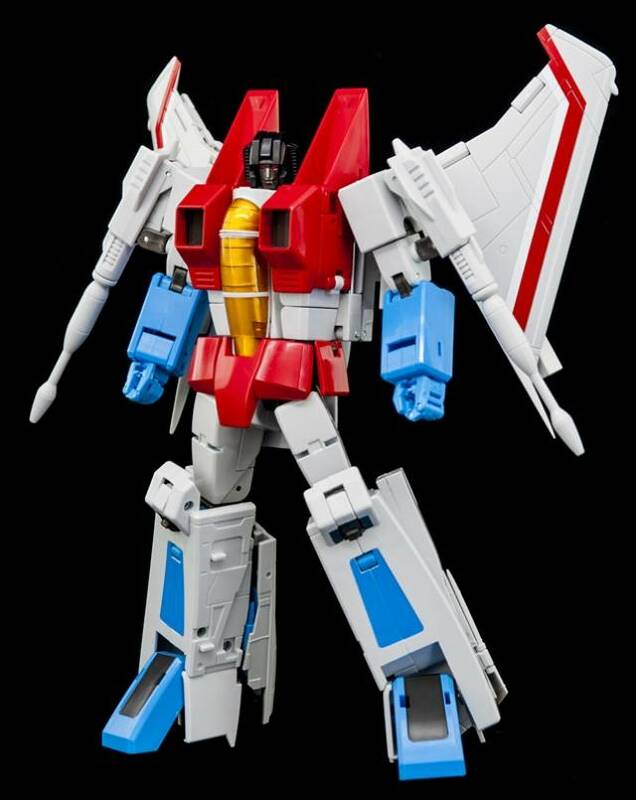 I waited for Someone to make a better starscream than Hasbro or Takara and finally maketoys has done it. The price is great and the figure is amazing. Some people said from the photos that the face looks to dark. In hand it's not, it's dark but it's cartoon accurate and a lighter dark. IMO the figure is close to perfect. Beware of my only complain, there are some sharp points. Paint is great, details are great and very impressed with poseabilty. Plastic is solid and die cast parts give it a good balance. 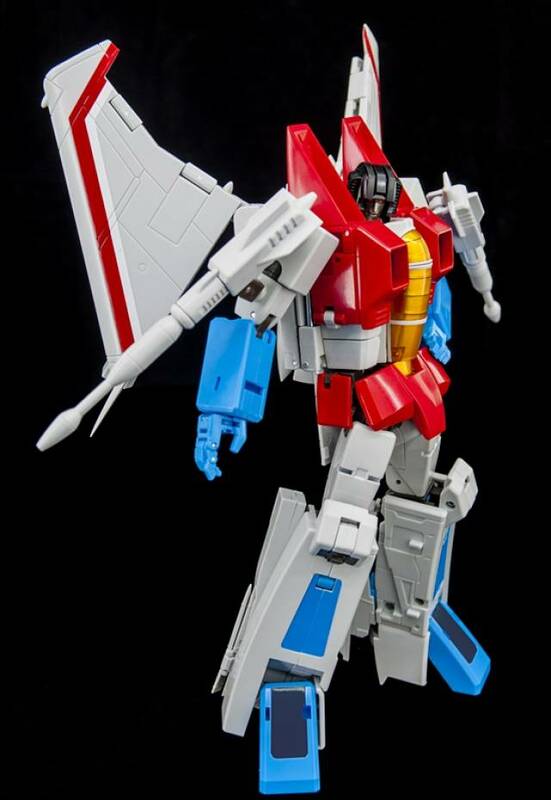 If you don't have a starscream this guy will make you very happy. If you have Hasbro or Takara than it's time to upgrade. 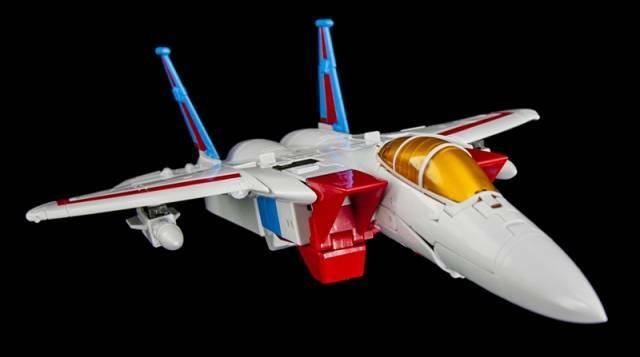 Please understand one thing up front; this is a great looking Starscream figure. The details are great, the paint apps are spot on, and his transformation is not overly complicated. If you don't have the Hasbro or Takara Starscream, this will certainly fill that spot on your shelf. The one pain point I have though, is the figure's feet. Getting him to stand on his own is a stuggle, as he is top heavy, and his feet are tight, but also if you don't align his feet correctly, he will topple, and when he does, he mostly falls backwards. What seems to cause this more than anything are a couple of points on his inner foot that are slightly longer than his heels. You can move his heels (the jet thrusters) around to help him balance better, otherwise he topples on those spurs. If those spurs were not there, he would stand on his own just fine. It is for those feet that I only give him 4 stars. "This Starscream is definitely a leader!" WOW. 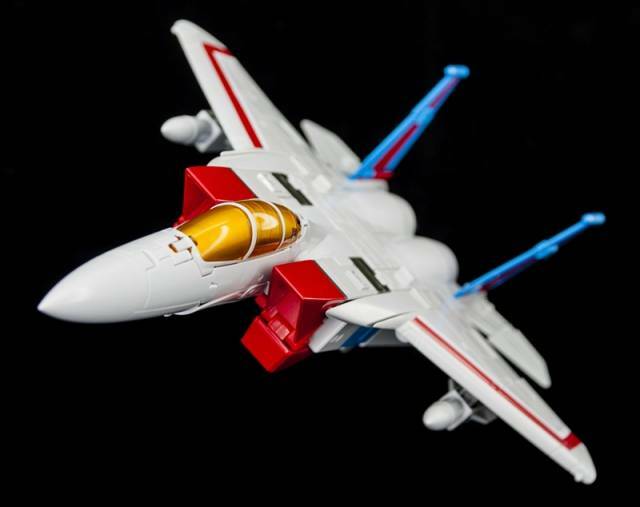 This Starsream is THE Starscream to have! The red on this transformer......just perfect. Good price for what this figure brings to the table. Good job, Make Toys! I started with the Takare coronation starscream, he's fine... but does make toys blow it out of the water! This guy fits mp36 in style and poses! The figure is sturdy, good weight in hand, nails dynamic action poses and hits key cartoon points for me personally. I shall easily get the other to seekers to complete the set! And the price! All these combos make me give it a five star! ALMOST PERFECT! the head is a bit small but the colors and posable legs and waste are incredible. 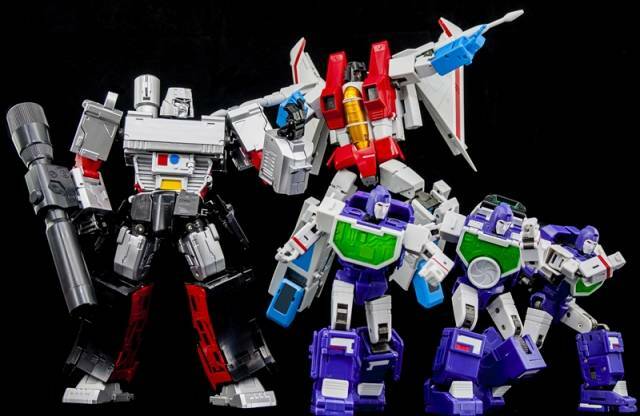 By far it is the best MP starscream and G1 accurate. I love this figure. "Jumped off of the screen!!!!" This is freaking awesome, it has paint, articulation, heft, and above all, a new mold. I have had all of the seekers, and I am selling all of them to swoop all of these instead, as soon as I got this guy I thought to my self, this could be the game changer, the seekers where always my fav, so when it is done right, smiles , all smiles, and I can look past the feeling of incompleteness in the rear, it looks not finished, but whos going to see it anyways??? Definite high recommend. This figure is awesome. Highly articulated, nicely painted and damn near perfectly Cartoon accurate. I have a review on Youtube for full details. the down side is he can't really look up. Flying figs should always be able to look up. 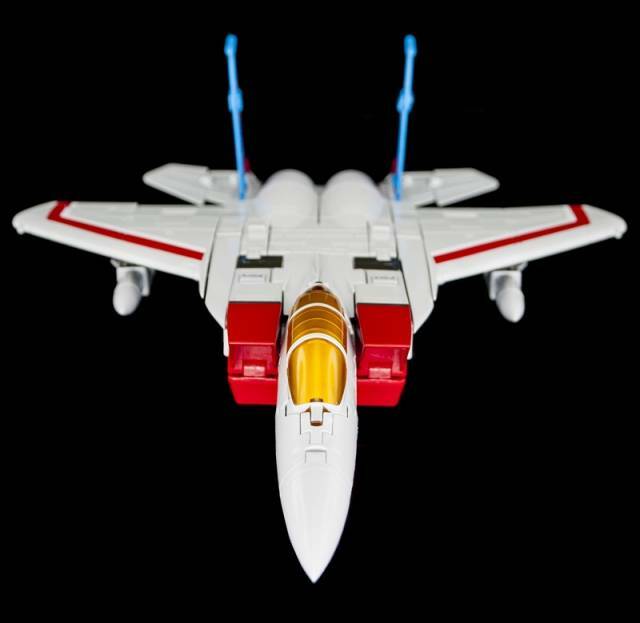 If there is anything else, he has no real play features in Jet mode outside of just being a jet. lol. Accessories are sparse compared to todays Masterpiece figures. 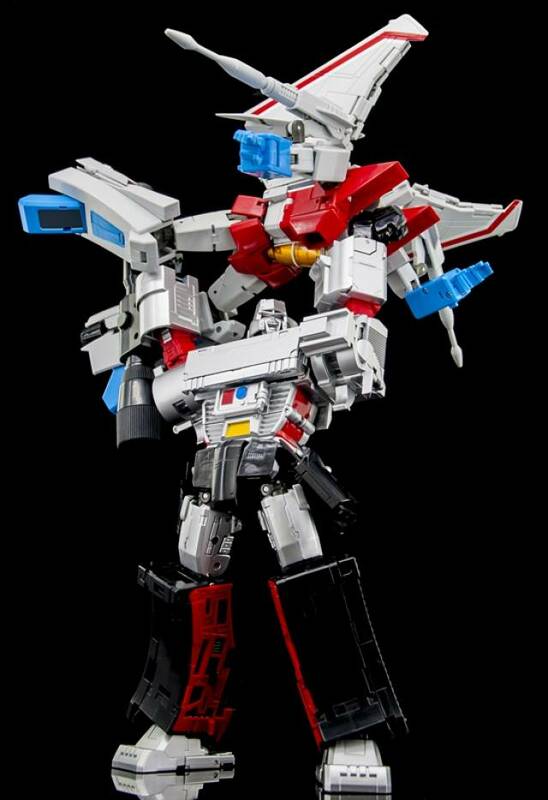 I owned the other two maketoys seekers and kept this on my wishlist for some time. I'm glad I finally pulled the trigger on this one. By far my favorite of the three. The colors are impeccable not a whole lot of paint but where it is applied it works well. Transformation isnt difficult either. A must buy, I'm all In. Can't wait for the coneheads.